Since school is starting back and sales are abundant, it’s time to clean out your pantry and get ready to stock up. One of the best ways to do this is to make a list of everything that is available in your pantry and post it on the inside (or outside) of your pantry door. There are lots of Seasonal Sales in August to be had, and these will help you fill the pantry up quickly. 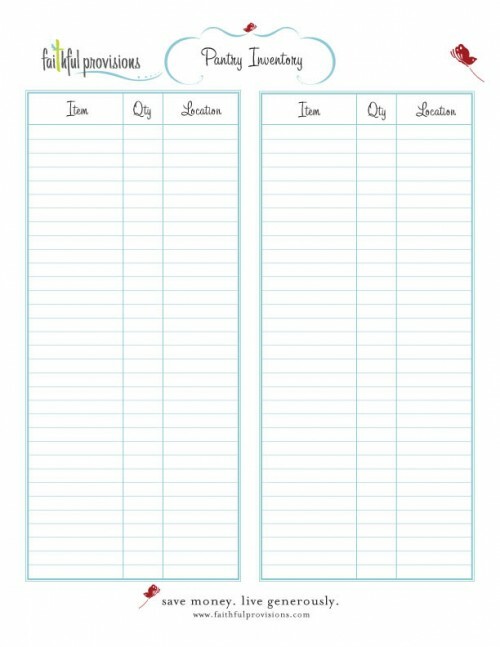 :: Download my FREE Pantry Inventory List Template, and let’s get started. *Find more organizational and money-saving tools on my FREE Downloads Page. Now that you’ve created some space, organize your pantry so that you can find your foods easily. What makes sense to you? Grouping canned goods by kind, or alphabetically, or by the foods that you will prepare with them? It’s your pantry–how do you want to organize it? You may want to keep your kids’ safety in mind, and rather than having them climbing the shelves, put the foods they like best on the lower shelves. Keep the foods you don’t want in their reach not only on the higher shelves, but also out of their line of vision. Use clear containers for easy , see-through storage, and be sure to label any containers that aren’t clear (you can grab these at Target for $1 each). A few pretty baskets can hold items like drink mixes, seasoning packets, or your favorite tea bags. You may want to invest in some Lazy Susan turntables to make the most of deep shelves. You’ll want to keep everything neat and tidy now, and you’ll be able to with my FREE Pantry Inventory List Template. Once you know what food items you have available, you’ll be able to meal plan and shop with much less stress, and you’ll have much more success in saving money! What are your tips to cleaning out and organizing your pantry? We would love to hear all your tips and tricks to keeping your pantry in order! I love your pantry inventory idea, but I’m not really clear on how to use it. Can you provide an example of how you use it? Great question! I would typically organize my pantry by category, which typically correlates with the shelf. But I would go with maybe “Baking” and write that in caps in the “Item” column, then under that list all the baking items, then move to “Canned/Packaged” and list all those . These items I tend to shelve together so the type and location will usually all go together. I hope that helps! Then would you use quantity column with a pencil and somehow keep track of what goes in and out? Thank you so much for taking the time to answer my questions. I found mine at Target. They tend to be in the kitchen area, not the organization one! Hope you find them! Another idea for organizing your pantry to is use a clear shoe organizer and hang it on the pantry door. I keep soup and seasoning mixes, small snacks, ziplock bags, etc. in mine and it keeps everything out of the way, right at arms reach, nothing falls through cracks, and it frees up more space on my shelves for the rest of my groceries. Heather, I love that idea!!! !